We saw an increase in atmospheric CH4 growth rate in the Arctic in 2007, but not in 2008. There were also large increases in the tropics in 2007 and 2008. I can not determine the relative amounts of the increase from the tropics vs. Arctic without a chemical transport model, but much of the increase was because of increased tropical emissions. The 2007 increase in the Arctic likely resulted from terrestrial wetland sources (i.e., not the processes Shakhova discuss), because of warmer than average conditions affecting microbial CH4 production of CH4. This is supported by measurements of CH4 isotopic composition. So the bottom line is that the atmospheric data are not consistent with a long term increase in Arctic sources. 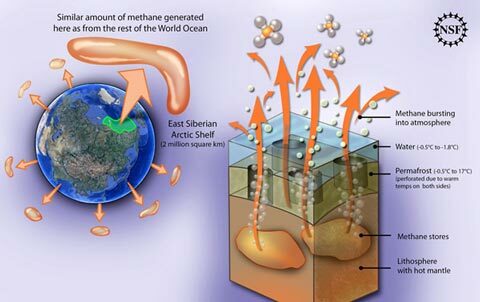 …subsea permafrost acts as a lid — the seal to prevent this methane escape. And being prevented for a period of time, being sealed for a period of time, means that this gas accumulates, and it accumulates under higher pressure —- this is what we have to give an example, this is what we have, for example, this bottle of champagne. So, you have a lot of gas inside, but it’s sealed for a period of time, and when you uncork this bottle, what you can see — it’s different from a bottle of mineral water left open for period of time, it’s just little bit of different. And I think that release of methane from this kind of seabed deposits disturbed by destabilization of subsea permafrost, provides a pathway for this methane — ready to go methane — because its release does not depend on production. It’s not time-dependent, it’s not temperature-dependent, it only needs the pathway to be released. Sounds like understatement to me… Shakhova and Semiletov are currently working to produce figures based on the summer 2009 fieldwork. More coverage of the paper at New Scientist, Times Online, and for Hot Topic’s coverage of methane news over the last three years follow the methane tag.